This awesome video, shot on May 16th, 1991, documented the last time the Iowa Class Battleship USS Wisconsin (BB-64) fired off its main battery. Watching her 16 inch guns going off in a crescendo and then ending in a full broadside is breathtaking, and the sound is ferocious. The Iowa Class’s Mark 7 16-inch guns and their huge turrets were like four-story rotating steel fortresses in their own right. Each massive 66-foot, 240k-pound rifled barrel had a life between 250 and 350 rounds before it needed to be replaced. They were capable of flinging shells weighing up to 2,700 pounds almost 25 miles at hunting rifle speeds. Each turret was operated by between 75 and 90 men, and they weren’t even attached to the ship. Their weight alone kept them seated, so if the ship were ever to rolled over, the gun turrets would have slipped out. 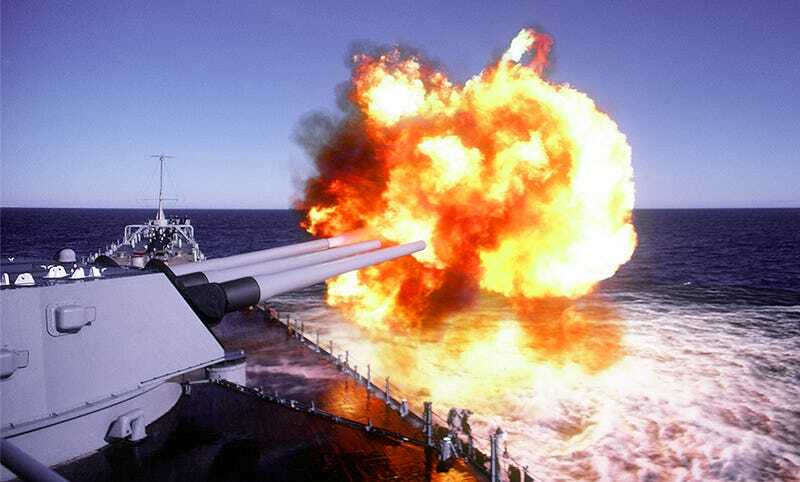 Even more impressive than the Iowa Class’s main battery was its fire control system. The Mark 38 Gun Fire Control System was one of the world’s first computers and included a director tower, plotting room, and data transmission system. The Iowa Class had plotting rooms and directors fore and aft for redundancy. The system could utilize optical or radar ranging and was tied to a series of gyros. When combined, the system was highly accurate and could take into account wind, Magnus Effect, gravity, the spin of the shell, the earth’s curvature, and coriolis effect. Upgrades added during the 1980s Reagan-era refit infused a small portion of modern technology, such as a radar that tracked the prior round’s course, with the seemingly ancient WWII system. This, along with more consistent propellant and a ship-borne UAV to call out targets and asses the gun’s damage after each volley, made the big 16 inch guns nearly surgical weapons. Still, many Iowa Class components, like spare gun barrels that were destroyed for no reason, have no manufacturer today, so the ship’s antique mechanical and electrical components would be very hard to replace or even service. As a result, actually returning these ships back wartime condition would be a challenging process to say the least. That being said, having even one of these sailing the high-seas as America’s flagship would be a very expensive but awesome display of American power projection.